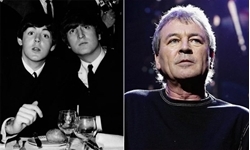 Deep Purple on Songwriting: “We're Using John Lennon and Paul McCartney's Way” . Beatles Radio: The Beatles, Solos, Covers, Birthdays, News The Fab 4 and More! During the recent interview with Etic’s Live, Deep Purple members spoke about a lot of topics. But only one is very interesting. Singer Ian Gillan has shared the process of writing new songs. He also talked on the band’s dynamics. “With Deep Purple, it’s always been the same. It’s part of the English way — it changes every day, but the elements remain the same. I’ve worked with Roger Glover since I was about 20; I was in a band called Episode Six in ’65. He taught me how to write songs. We’ve done everything together since then. It’s a bit like the way John Lennon and Paul McCartney used to work insofar as sometimes Roger writes everything, sometimes I write everything and sometimes we do it together, but the music always comes first. It starts the same every day, during the recording and writing session. We go into a big office six days a week. We meet up, make a cup of tea, talk about football, family, cars, rubbish; then either Ian Paice or Don or anyone kicks off and starts jamming.